Why is Wilson Reading System (WRS) Certification Important? Critical factors for student success are teacher knowledge and skill. Teachers must have an in-depth knowledge of language structure and master multisensory and diagnostic instructional techniques in order to meet the needs of dyslexic students. To achieve this, Wilson Language Training® provides extensive teacher training in the Wilson Reading System® by offering supervised certification programs. What is Involved in Achieving WRS Certification? The WRS Level I Certification program includes 90 hours of online coursework and an intensive 60-lesson supervised practicum with a Wilson Trainer. Acquire a very sophisticated working knowledge of the sound-symbol system of English (phonology) and its structure (morphology). Use specific diagnostic techniques in the teaching of reading and spelling to an individual with a significant reading disability. Demonstrate explicit teaching of fluency, vocabulary, and comprehension. 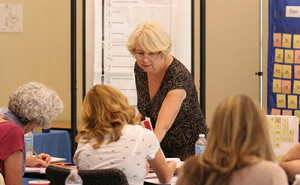 WRS Level I Certification prepares teachers to use the program with individual students. Wilson Language Training also offers WRS Level II Certification to prepare teachers to successfully deliver the program to groups of students as well as teach advanced concepts of language structure. Individuals who achieve WRS Certification are eligible to receive professional credentials from Wilson Language Training. How Do I Know if an Educator is WRS Certified? We strongly recommend that students needing intense remediation with the Wilson Reading System receive instruction from a WRS certified teacher. To verify that a teacher or tutor is WRS certified or to find a WRS certified instructor in your area, please contact us or call the Wilson Customer Support Center at 800.899.8454 during our business hours. While some teachers with multisensory, structured language training have been able to use the WRS program and materials with a degree of success after attending the three-day WRS Introductory Course, they are not considered trained in the Wilson Reading System. Our policy to provide a list of only WRS certified individuals who are currently credentialed as a Wilson® Dyslexia Practitioner or Wilson® Dyslexia Therapist is our way of assuring the integrity of the program.